Simple demo of QR-code and barcode detection and decoding using the ZBar library. Detect barcodes and QR-codes, and decode their contents. QR-codes (Quick Response Codes) are popular 2D patterns that contain embedded information, such as a string of text, a URL, etc. They basically work like barcodes, coding information into a high-contrast, geometric pattern that is easier to detect and decode by a machine that more conventional human-written text or drawings. You should be able to sustain 30 frames/s with camera resolution 320x240, and 15 frames/s with camera resolution 640x480 when running this module inside the JeVois smart camera. This module can send standardized serial messages as described in Standardized serial messages formatting. One message is issued for every detected QR-code or barcode, on every video frame. id: type of symbol (e.g., QR-Code, ISBN13, etc). Note that when serstyle is Fine, only 4 corners are returned for each detected QR-code, but many points are returned all over each detected barcode. Beware to not exceed your serial bandwidth in that case. Definition at line 79 of file DemoQRcode.C. Definition at line 86 of file DemoQRcode.C. Definition at line 92 of file DemoQRcode.C. Definition at line 98 of file DemoQRcode.C. 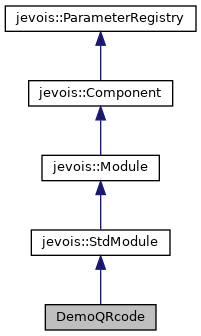 References jevois::rawimage::convertToCvGray(), jevois::RawImage::height, itsQRcode, and jevois::RawImage::width. Definition at line 124 of file DemoQRcode.C. References jevois::rawimage::convertToCvGray(), jevois::rawimage::drawFilledRect(), jevois::RawImage::fmt, jevois::RawImage::height, itsQRcode, JEVOIS_REGISTER_MODULE(), jevois::rawimage::paste(), jevois::RawImage::require(), jevois::Timer::start(), jevois::Timer::stop(), jevois::RawImage::width, and jevois::rawimage::writeText(). References jevois::rawimage::convertToCvGray(), jevois::rawimage::drawFilledRect(), jevois::RawImage::fmt, jevois::RawImage::height, itsQRcode, jevois::rawimage::paste(), jevois::RawImage::require(), jevois::Timer::start(), jevois::Timer::stop(), jevois::RawImage::width, and jevois::rawimage::writeText(). Definition at line 179 of file DemoQRcode.C. Referenced by DemoQRcode(), and process().